Your Malaga Airport Transfer specialists. Chauffeur driven airport transfers and pickups for Málaga airport. Plush chauffeur driven cars, people carriers and minivans along with prompt and professional chauffeur drivers. 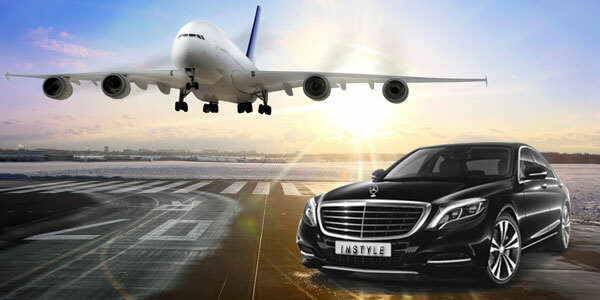 Marbella in-Style is a leading Malaga Airport transfer specialist. We will meet and greet you at Málaga Airport (AGP) in one of our chauffeur-driven cars and bring you in-Style to your hotel or residence in Marbella, Puerto Banús, Estepona, etc. Your chauffeur will meet and greet you with your private chauffeur driven Mercedes E class at the Malaga Airport (AGP). He will be holding a greeting card with your name directly after the baggage claim. Marbella is the capital of the Costa del Sol, in Spain's southern coast, and is approximately 50 km from Malaga. 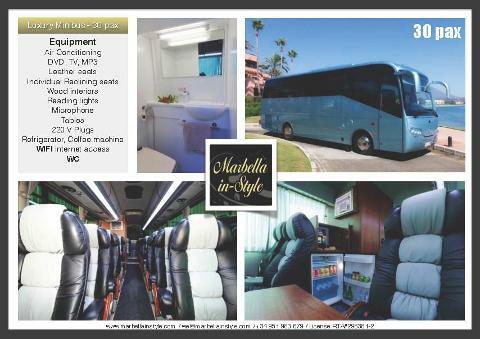 A transfer from Malaga airport to Marbella takes about 40 minutes. Spread across 40 km of coast, Marbella offers a number of luxury resorts and beach towns, including Puerto Banus, Guadalmina, Sierra Blanca, Elviria, Nueva Andalucía, El Rosario, Cabo Pino, etc. World-known for the concentration of luxury shops, yachts and sport cars, Puerto Banus represents without doubt the essence of luxurious tourism. It lies 5 km from Marbella and a transfer from Malaga Airport to Puerto Banús takes 45 minutes. Constructed in 1970 by Jose Banús in mediterranean style, Puerto Banus offers today a rich gastronomical and leisure experience for tourists and locals. In summer you can go luxury shopping to some of the bests brand shops until 5am. Book with us your Malaga airport to Puerto Banus and arrive stress-free and in-Style. Benahavis lies approximately 70 km to the west of Malaga and the transfer from Malaga airport to Benahavis takes about 50 minutes. The municipality is extended among mountains and valleys, and is home for some of the best luxury hotels like Villa Padierna, urbanizations like La Zagaleta and Madroñal, or golf clubs like Marbella Club Golf Resort. The town of Benahavis is also known for the gastronomic offer with plenty of restaurants. Estepona offers a more relaxed atmosphere than other cities along the Costa del Sol. A Malaga airport transfer to Estepona will take about an hour and 70 Km. The surrounding area of Estepona offers natural beaches, numerous golf courses and plenty of sport activities in the nature ie. walking, trekking, cycling, etc. Visit the municipal market in Estepona to discover a great array of fresh products, directly from the sea and the countless number of organic local products from orchards and fields. Sotogrande is with Marbella one of the most exclusive destination in South of Spain. It lies approximately 100 km to the west of Malaga Airport and takes around one hour drive. While most of the tourists know Sotogrande because of golf, mainly Valderrama Golf Club and Finca Cortesin, it is also home for one of the best Polo Clubs in Europe, the Santa Maria Polo Club. 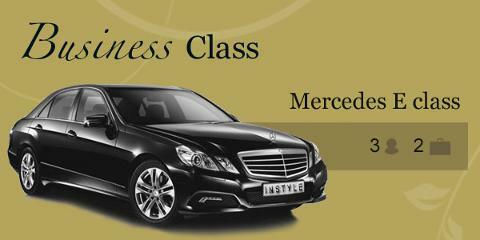 The Mercedes E has been for decades the standard for airport transfers in Business Class. With space for 3 passengers and luggage for two, the Mercedes E is the most popular option for airport transfers. 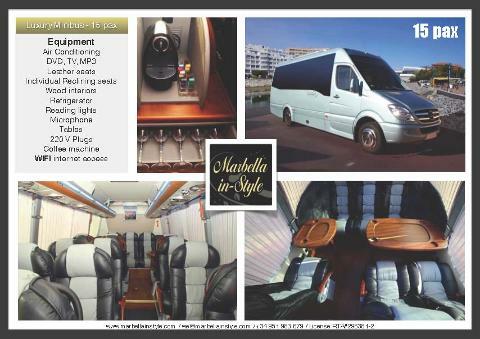 Popular for families with children, golf players or just groups flying with plenty of luggages, the Mercedes Viano will carry up to 7 passengers in chauffeur driven luxury. More than just a people carrier - whatever the occasion, the Viano chauffeur driven MPV will give your party the space and flexibility for an airport transfer and pick-up in impeccable safety and comfort. 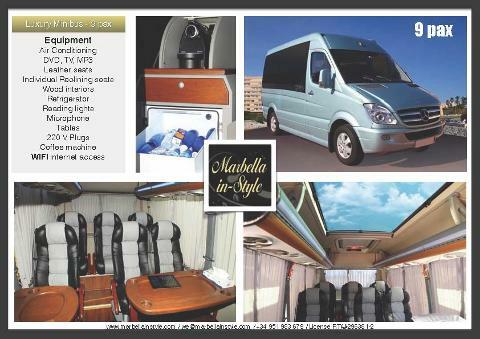 Luxurious leather trim with space for up to 3 passengers to be chauffeured in complete comfort. 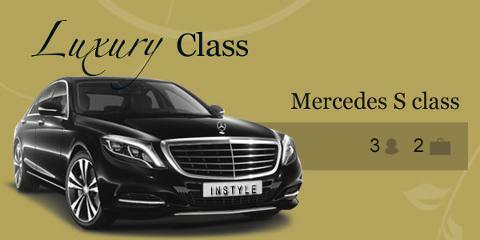 The Mercedes S Class sets the standard in first-class chauffeur driven luxury and prestige for airport transfers. 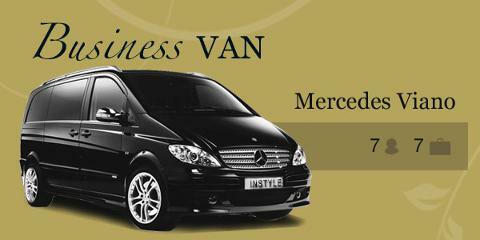 Luxury Mercedes minibus for groups. The meeting point with your private driver in Malaga Airport (AGP) is direct after the baggage claim. Once you have your luggage, you will have to walk few meter and go through the sliding doors into the arrivals area. Your driver will be waiting for you most of the times on the right side of this area. Please don't leave the terminal building. If you can't find your driver, call our contact center. When booking your Malaga Airport transfer, please provide us always with your flight code. Your driver will be updated with real-time information about your flight and be prepared if there is any delay. A Malaga Airport Transfer includes a max. waiting time of 60 minutes for landing flights. Our driver will be holding a sign with your name or any other text that you specify when booking. There is no extra charge for stopping on route (15 min. max.) but should be notified when booking. Our drivers speak spanish and have a basic understanding of english. In case you would like to make a change on the go, please communicate 24x7 with our contact center by email or phone. No Cancellation Charge for cancellations received by email before the day of your transfer. All our vehicles are fully insuranced and perfectly maintained, and comply with Spanish transport regulations. All our drivers are certified and licensed professionals dedicated to the public transport sector and possess the necessary training and experience to provide the level of service you expect.